While I always feel young at heart, I’m beginning to see the world from a slightly different angle. Yes, I know I’m not old yet, but sometimes it’s refreshing to get a little bit of perspective when you take a step back. I did just this on Tuesday. I’ve always been the overachieving type, who goes to the first day of high school and signs up for absolutely every club (society) possible, thinking this will be of benefit one day when I have to apply for college, and to help me to discern what I actually enjoy doing and want to continue as a career potentially. Well here I am now, ten years later, meeting the next generation of me. Just much more grounded and confident in the direction their lives are going to go. CHOSA had the pleasure of hosting four grade 11 high school students to come and volunteer for the day to learn a little bit more about what CHOSA does. Now, if any of you know CHOSA, you may know that this isn’t the simplest of explanations, as CHOSA carries out many different roles, ranging from a funding organisation, to also a capacity building organisation, and doing everything in between to grow current grassroots organisations that are improving the lives of orphaned and vulnerable children. 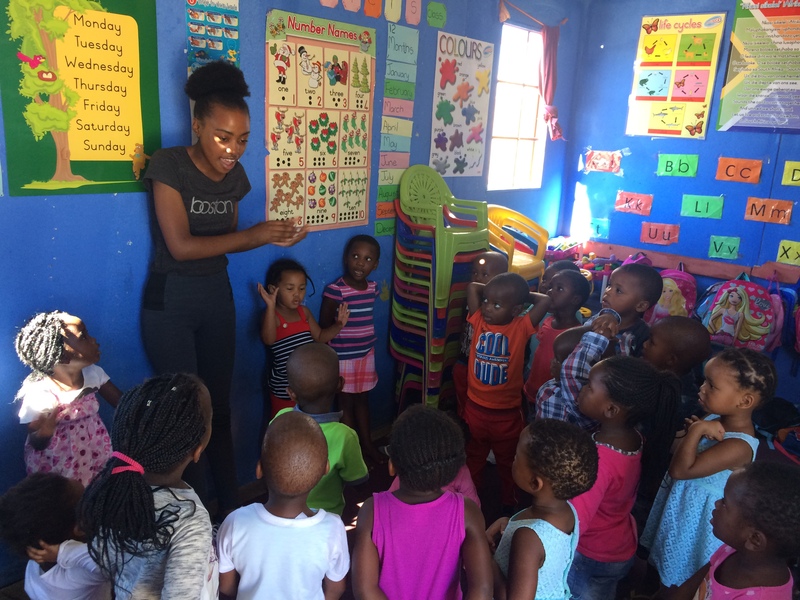 So after a brief introduction to CHOSA at our main offices, we were off to the field to go and spend the day at Blessings, one of preschools (creches) that CHOSA supports. Upon arrival, I introduced these young women to the principal of the school, who then gave them a tour around the various container classrooms on the property. Immediately afterwards, the young women divided themselves into classrooms that they felt they would be able to provide most support for, and each jumped right into the routine that was being followed for the day. There was no fear of any language divide, overwhelm by the number of kids in the classroom, or wanting to be with their other friends. As I popped my head into the various classrooms to provide them support if needed, I quickly realised they were already in their element: singing songs, reading stories, and carrying out math lessons. The children at Blessings absolutely loved them, and had a great day getting to share each other’s company. Reflecting on the day with these ladies, I learned that they had aspirations ranging from becoming a paediatrician to heading into a career in finance. They didn’t need to come spend their day volunteering with CHOSA, but they wanted to. Seeing their compassion for children they had just met that morning, and eagerness to get involved, shows me there is hope for the future. If these young ladies are any example of the next generation of youth coming through the schooling system, then I believe there is lots of hope for South Africa’s dynamic development and growth. And I’m inspired to have individuals such as them continue to come to CHOSA and actively engage with our communities to work towards positive change. If you are interested in getting involved with CHOSA, please reach out to us by emailing [email protected] We would love to have you!